The Buff is named for the rich cinnamon colour of its body feathers. The breed was recognized by the American Poultry Association in 1874 but very few now exist in America and there is no longer a standard for it there. 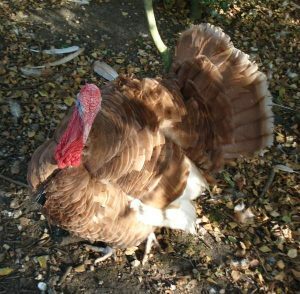 The breed was extremely popular in Britain at the turn of the last century with its own Buff Turkey Club in the early 1900s. Eyes: Iris dark hazel, pupil blue-black. Plumage in both sexes: A deep cinnamon buff. Flights and secondaries: Very pale buff. Tail: Deep cinnamon buff throughout edged with a paler band at the tip. Mature stag 10kgs – 12.7kgs (22lbs – 28lbs). Mature hen 5.4kgs – 8.1kgs (12lbs – 18lbs). Any black on feathering. More than one third any colour other than buff showing in either primaries, secondaries, or main tail feathers. A pale creamy brown throughout.